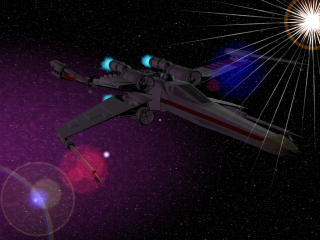 Model of an X-Wing created entirely in OFX. 55,805 vertices, 127380 faces. The model in the image takes up nearly 60MB of hard drive space because the textures have been made huge for future texture detail work and the OFX geometry takes up 6MB with all the fixed-to maps applied. Needless to say, this took some time to make. The image is an OFX Animator scene with a background generated in Diard Software's Universe. Filters used in OFX included lens flare and explosions. The image was resized from 3072x2304 to 1024x768 and color reduced in PaintShop Pro 5 to remove any remaining aliasing and smooth the image's colors. I think the results speak for themselves. If you've got the time and patience, you can make professional-quality art with OFX, no problem! I'll gladly e-mail the original bitmaps to anyone interested. Just tell me what you want. Also, this is part of a larger project and I'm looking for someone out there to give me some texturing pointers. Any takers?